Herman Hudepohl began leading the introduction and implementation of PuMP into the New Zealand Defence Force almost four years ago now. In this interview you'll get insight into his approach for making this organisation-wide change. Why Won’t Leaders Fix the Performance Measurement Problem? If performance measurement is fundamentally important to business and organisational success, why do so many leaders get it wrong, and so few are willing to fix it? When measurement is done to people, the wrong things change. But when measurement is done through dialogue, it dignifies everyone, and the right things change. 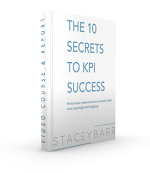 Are You Choosing KPIs Too Quickly? Without evidence of an outcome, how can we know the outcome matters? And how can we know if a change initiative to impact that outcome is worth doing? Can Executives Accurately Assess Their Own KPI Maturity? Research into KPI maturity in organisations is often based on self-assessment surveys. But how can executives in organisations with low KPI maturity accurately assess their KPI maturity?